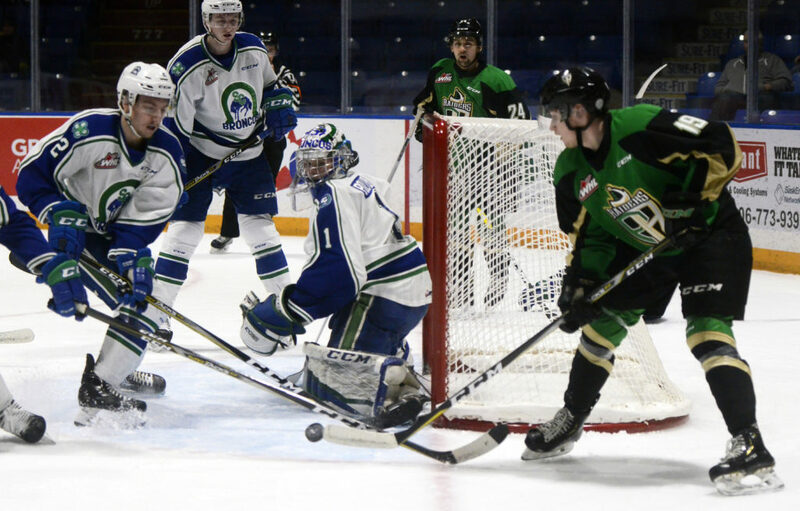 East Division foes met on Wednesday evening as the WHL’s best Prince Albert Raiders were in Swift Current to duel the Broncos at the Innovation Credit Union i-Plex. Broncos goaltender Isaac Poulter was stellar over the course of a scoreless first period as the 17-year-old issued 13 saves. The Raiders broke the deadlock as forward Dante Hannoun scored a power play marker 2:24 into the second period to give Prince Albert a 1-0 lead. That margin was doubled when Parker Kelly picked up some speed down the left wing with possession of the puck, got in behind the Broncos defence and beat Poulter with a low forehand-backhand move. Swift Current had trouble generating solid scoring chances but had a golden opportunity to get on the board when Matthew Culling made a pass from behind the Raiders cage to find Ian Briscoe all alone in front. The 19-year-old Briscoe got a backhander attempt off but was denied by Raiders netminder Boston Bilous. An early power play chance for Swift Current was exactly what the doctor ordered as Joona Kiviniemi ripped a one-timer home to claw the Broncos back into the game at 2-1 with plenty of time left in the third. The Raiders’ Kelly added an insurance marker with less than five minutes to go in the third period and it proved to be enough as the Broncos lost their sixth in a row 3-1. Shots on goal were 43-16 in favour of Prince Albert. The Broncos power play unit went 1/4 while the Raiders finished 1/3 on the man advantage. Swift Current gets back on the ice Friday evening when the club gets set to host Charlie Horse’s birthday presented by Safeway against the Lethbridge Hurricanes. Puck drop is slated for 7:00pm CT.